There’s lots to give thanks for. Celebrate fall with these two FunZones in October. With Vendors, Artists, Live Entertainment and your children’s entertainment provided by your choice for bouncy castle rentals. 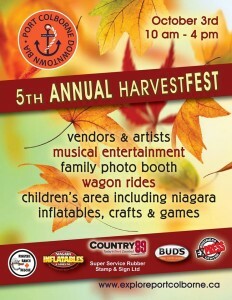 One of Ontario’s largest Thanksgiving Festivals. With over 150 juried artisans, food vendors, demonstrators & entertainers participating in this four-day long annual tradition, there is always plenty to do, see, and explore at our flagship conservation area. For the 2nd year in a row we will also be hosting a Farmer’s Market where you can pick up local produce and VQA Wines.